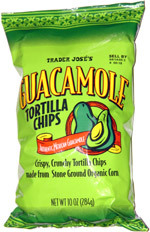 Taste test: These triangular tortilla chips were a pale yellow in color, with greenish flavor powder on them. The level of flavor powder varied quite a bit from chip to chip, and the ones with more powder definitely had a stronger guacamole taste. The chips were strong and crisp, and the flavor was quite good, with a some spiciness to it. 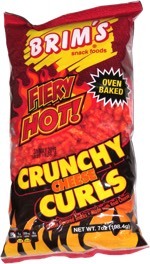 These chips were a big hit around the chip bowl. Smell test: Very mild guacamole-like smell.